We make every effort to ensure that you will never need to return anything to us, however should you need to do so we will do our best to make the process as easy as possible for you. Please select from the options below for information on how to return your item, which differs depending on your situation. We will ensure that your problem is investigated and resolved as quickly as possible. How do I arrange to return a faulty or defective item? Please email customer.service@hafele.co.uk to register your concern and we will contact you from there. Please state the delivery address if different to your original order and do not dispose of any goods unless advised to do so by customer services. We may request a photo of the damaged item, which you can email to the same address. Can I return an item that is not faulty? Please register your return by completing the returns form, which you can access here. How do I return a direct delivery or special order item? Please contact our customer support team by emailing customer.service@hafele.co.uk or calling 0800 171 2909 and a member of our team will advise. Are then any items excluded from the 28 day ‘unwanted’ returns policy? What do I do if an item develops a fault after 28 days? 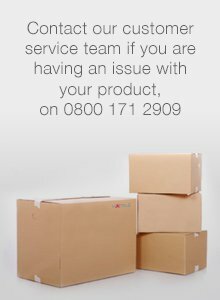 If you have a faulty item please contact our customer support team by emailing customer.service@hafele.co.uk or calling 0800 171 2909 and a member of our team will advise. Who will pay for the delivery of the item? If the item IS NOT faulty the return and cost of postage of the goods will need to be arranged and paid for by yourselves within 20 days of receiving your returns label. If the item IS faulty the return of the goods will be arranged by Häfele and we will cover the haulier costs. Please ensure that the returns label is clearly displayed on the outside of the packaging. My query is not answered above? If you have any further queries please contact our customer support team by emailing customer.service@hafele.co.uk or calling 0800 171 2909.